Free shipping. Buy direct from HP. 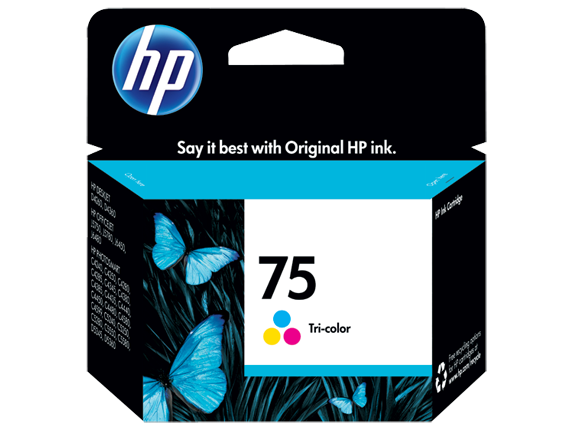 See customer reviews and comparisons for the HP 75 Tri-color Original Ink Cartridge. Upgrades and savings on select products. Get photos that last longer than store-processed prints. Turn snapshots into masterpieces. Save time and money, using HP ink cartridges with superior reliability and performance.Easily choose the Original HP ink cartridge tailored to fit your printing needs.Be notified when your printer ink levels are low. Get photos that last longer than store-processed prints.Turn snapshots into masterpieces. Original HP ink cartridges are widely available online and in stores.Enjoy easy ink cartridge replacement, using supplies specifically designed to fit your printer.Get free, convenient return and recycling. 1 Based on HP Image Permanence Lab light-fade testing under glass. Confirmation test in progress at Wilhelm Imaging Research. For details visit http://www.hp.com/go/printpermanence. 2 Program availability varies. HP printing supplies return and recycling is currently available in more than 40 countries, territories and regions in Asia, Europe, and North and South America through the HP Planet Partners program. 3 HP SureSupply program features and availability may vary by country. For more information, visit http://www.hp.com/learn/suresupply. 4 Using Original HP inks and HP Premium Plus Photo Paper. Based on HP Image Permanence Lab light-fade testing under glass. Confirmation test in progress at Wilhelm Imaging Research. For details visit http://www.hp.com/go/printpermanence.